75 towards Brooksville. Turn left on Rte 50 Truck bypass and take it to US41. Turn right and go 1 mile on US41 to Rte 98. Turn left and take US98 north/west for 12 miles and course will be on your right. *** Course only allows soft spikes *** *** Very strict cancellation policy applies*** You will be charged for the number of players on your voucher even if fewer golfers play. Take Florida's Turnpike to I75. Take I75 to exit 61 (Rte 50). Take Rte 50 west towards Brooksville. Turn left on the Rte 50 Truck bypass (Route 50A) and take Route 50A to US41. Turn right and go 1 mile on US41 to Rte 98. Turn left and take US98 north/west for 12 miles and course will be on your right. *** Course only allows soft spikes *** *** Very strict cancellation policy applies*** You will be charged for the number of players on your voucher even if fewer golfers play. Take Rte 50 west towards Brooksville. Turn left on Rte 50 Truck bypass and take it to US41. Turn right and go 1 mile on US41 to Rte 98. Turn left and take US98 north/west for 12 miles. The course will be on your right. *** Very strict cancellation policy applies*** You will be charged for the number of players on your voucher even if fewer golfers play. Go to ALT19. Take ALT19 north to US19. Take US19 north past Weeki Wachee to Rte 98. Turn right and take Rte 98 south/east. Course will be on your left. *** Course only allows soft spikes *** *** Very strict cancellation policy applies*** You will be charged for the number of players on your voucher even if fewer golfers play. Take Rte 682 (Pinellas Bayway) east to I275 north. Take I275 to Rte. 60 (Courtney Campbell Causeway/Clearwater). Take Rte. 60 west to Rte. 589 Veterans Expressway/Suncoast Pkwy. toll road. Take Rte. 589 north until it deadends into Rte. 98. Turn right and take Rte. 98 east for approx. 1/2 mile and the course will be on your left hand side. *** Course only allows soft spikes *** *** Very strict cancellation policy applies*** You will be charged for the number of players on your voucher even if fewer golfers play. Take US 19 north past Weeki Wachee to Rte 98. Take Rte 98 south and the entrance will be on your left. *** Course only allows soft spikes *** *** Very strict cancellation policy applies*** You will be charged for the number of players on your voucher even if fewer golfers play. Take Gulf Blvd. to Rte 666 (Madeira Beach Cswy/Tom Stuart Cswy). Take Madeira Beach Causeway east for 1½ miles to ALT19. Turn left and take ALT19 north to US19. Take US19 north past Weeki Wachee to Rte 98. Take Rte 98 south and the entrance will be on your left. *** Very strict cancellation policy applies*** You will be charged for the number of players on your voucher even if fewer golfers play. Take I75 to exit 61 (Rte 50). Take Rte 50 west towards Brooksville. Turn left on the Rte 50 Truck bypass (Route 50A) and take Route 50A to US41. Turn right and go 1 mile on US41 to Rte 98. Turn left and take US98 north/west for 12 miles and course will be on your right. *** Course only allows soft spikes *** *** Very strict cancellation policy applies*** You will be charged for the number of players on your voucher even if fewer golfers play. Take US19 to Rte 98. Take Rte. 98 south/east. Course will be on your left. *** Course only allows soft spikes *** *** Very strict cancellation policy applies*** You will be charged for the number of players on your voucher even if fewer golfers play. Take Rt. 580 east to Rte. 589Veterans Expressway/Suncoast Pkwy. This is a toll road. Take Rte. 589 (Veterans Expwy. /Suncoast Pkwy. ) all the way north until it deadends into Rte. 98. Turn right and take Rte. 98 east for approx. 1/2 mile and the course will be on your left hand side. *** Course only allows soft spikes *** *** Very strict cancellation policy applies*** You will be charged for the number of players on your voucher even if fewer golfers play. Leave the airport and take BeeLine Expwy west to Florida Turnpike. Take Florida Turnpike north to Rte 50. Take Rte 50 west all the way past I75 towards Brooksville. Turn left on Rte 50 Truck bypass and take it to US41. Turn right and go 1 mile on US41 to Rte 98. Turn left and take US98 north/west for 12 miles and course will be on your right. *** Course only allows soft spikes *** *** Very strict cancellation policy applies*** You will be charged for the number of players on your voucher even if fewer golfers play. Take US19 north for approx 35 miles to Rte 98. Turn right and take Rte 98 south/east. Course will be on your left. *** Course only allows soft spikes *** *** Very strict cancellation policy applies*** You will be charged for the number of players on your voucher even if fewer golfers play. Go to County Line Rd and take County Line Rd west to US27 / US25 (in Haines City). Take US27 north 22 miles to Rte 50. Take Rte 50 west all the way past I75 towards Brooksville. Turn left on Rte 50 Truck bypass and take it to US41. Turn right and go 1 mile on US41 to Rte 98. Turn left and take US98 north/west for 12 miles and course will be on your right. *** Course only allows soft spikes *** *** Very strict cancellation policy applies*** You will be charged for the number of players on your voucher even if fewer golfers play. From Treasure Island, go north on Gulf Blvd. to Rte 666 (Madeira Beach Cswy/Tom Stuart Cswy). Take Madeira Beach Causeway east for 1½ miles to ALT19. Turn left and take ALT19 north to US19. Take US19 north past Weeki Wachee to Rte 98. Take Rte 98 south and the entrance will be on your left. *** Course only allows soft spikes *** *** Very strict cancellation policy applies*** You will be charged for the number of players on your voucher even if fewer golfers play. Always a good course to play.. nice. First time visiting this course. Drove from Orlando to try it. The expectations were met. Staff friendly and course enjoyable. Would like to play later is season when it is a bit more lush. Wasn't overly impressed, found it a bit scrappy and fairways untidy. Preferred Oaks. Great layout and super greens! We will be back. We were staying in Orlando, but wanted to try a different type of course. After reading reviews, I booked Pine Barrens. I was not disappointed, really varied course, loved the tree lined fairways, good condition of the course, and the practice green is the best I have ever seen. Worth the drive if staying in Orlando. Enjoyed both the golf courses at World Woods. Hope to get back there in the near future. Awesome - a must play in Florida. Great place for a day of golf, 2 rounds. Fantastic that the second round is free. Pine barrens challenging, Rolling Oaks more scenic, like to end the day with this course. I will come again there. Even better than it's sister course. I could spend my whole vacation just playing these 2 courses. Simply great golf. Over the top spectacular! We had booked the Rolling Oaks course but the staff sent us off on Pine Barrens. The layout of this course is not like any other course in Florida. It reminded us of a blend of South Carolina and Augusta National. Beautiful! The conditions were superb. I've played 500 or more courses and this was, by far, the best conditioned course I've ever played. Some members of my group enjoyed the course so much, they played another 18 holes in the afternoon. This is a must play and will be added to our yearly itinerary. One of the very best in Tampa! One of the best courses out there, price, layout and landscape unbeatable. Worth the trip! Nice course! Didn't feel like I was golfing in Tampa. More like Michigan with all the pine trees!! Worth every penny, classy course, great condition, will return next year. All 8 of us gave it a big thumbs up !! Anyone who goes to Tampa should play both WW courses. The greens were the best I have ever seen them. Pins in very challenging positions. Pace of play good, and not a house or structure in sight on either course. Like going to a Golf Spa for the day. We wouldn't go to Tampa if we couldn't do the 36 holes here. Fantastic. Excellent golf courses. We go back every year (last 9 years). A must play in central FL. Great course even with winter conditions. Play it twice. Played pine barrens. Loved it from 1st to the 18th. Greens were in great shape. Loved the variety of holes from long 4's to short 4's. I heard it was a nice course and it didn't disappoint. Played Pine Barrens on the way back to SC from the Fort Myers area in Florida. Great stop, great golf course. Totally enjoyed it. Would recommend it to anyone spending time in that area of the world !!! This was my favorite of the two though the group enjoyed both. Challenging but very fair. Plan to visit again. Good course. The fairways were more like what I am used to in NH. The greens were very true and fast. Pine Barrens is a great experience. Outstanding layout - fair yet challenging course. Played second round in afternoon at Rolling Oaks - to get the replay bargain price. Great layout - course in good condition. Played Rolling Oaks in the afternoon - and was also in good condition. Spectacular course in fantastic condition. Great to play a florida course that is not flat with so many contours - rolling fairways and beautiful scenery. The added bonus is no houses! good course conditions staff were friendly. Pace of play was good. Big challenges but fun to play. One of our must play courses each year. Everything about this place is good. Coursechallenging and in fine shape. Super friendly staff from pro shopto starter to restaurant. One of my favorite courses in Florida. It was in great shape and we had a great time. Did not care for the course to many waste bunkers. Played both courses as a part of the replay package.Pine barrens is all you want to take on. Plenty of trouble if yougo looking. The sister course was a welcome change. Staff wasfriendly and courteous. Fantastic Track....wish we would have booked another day to play the Rolling Oaks Course. Beautiful conditions - well kept - nice practice facilities and challenging and fun layout. We will be back to play again soon! Exceptional Golf Course. Well maintained. Staff veryfriendly. Played both courses at WW and like always - theexperience was superb. Hard to say which course I like mor. Wellworth the ride. Outstanding golf course. Would definitely play againand again. Both Courses were very nice. Fantastic course. My favorite course of the trip.Scenic and very easy on the eye. Spectacular course! I highly recommended and wouldplay again and again. 36 holes both days. GREAT as always. Why playelsewhere? First time back after several years and as always itwas a great day of golf! Played both courses and each wasimmaculate. No crowds. greens were beautiful and Pine barrens #4is as pretty a golf hole as you'll find in FL. What a great facility and one of the best courses inthe world. Excellent course for the money. Challenging layout. Very good course. Challenging and fun. This was the best 36 holes of golf at one facilityour group has ever seen in our 18 years of golfing. Both courseswere beautiful - interesting and had great greens. Beautiful setup and very fun course! A little of the beaten path - but worth the drive. Does not look like your typical FL course. Enjoyable round and would play again. Tom Fazio at his best. If this is not his best I don't know what is. Hope you enjoy sand cause you will see a LOT of it - although staying out of it is not a problem as long as you keep the ball in play. My group has played here 6 years in a row. It's a bit of a hike from Tampa - but worth it to us as it always seems to be in great shape and the course layouts are breathtaking. A very relaxing - must-play course. Nice course. Nice layout and a pretty course. Alittle rough around the edges. You could tell that normally wellkept. Great Course. Starter and ranger were excellent. If you have played World Woods Pine Barrens Golf Course, we would like to hear from you. Tom Fazio designed this must play and must see-to-believe, 36-hole golf facility, referring to it as his "best work." The caliber of the golf courses and the quiet location (which is endowed with mature, pristine forestry and ample vegetation) offers a world-class golf experience. World Woods has made multiple changes to the entire facility, including extending the multiple teeing grounds on both facilities and `tifteagle' greens on Rolling Oaks. Both Pine Barrens and Rolling Oaks have been listed among the top 100 golf courses in the US for many years. Pine Barrens is one of only 16 golf courses rated in 2004 as a five-star golf facility by Golf Digest. 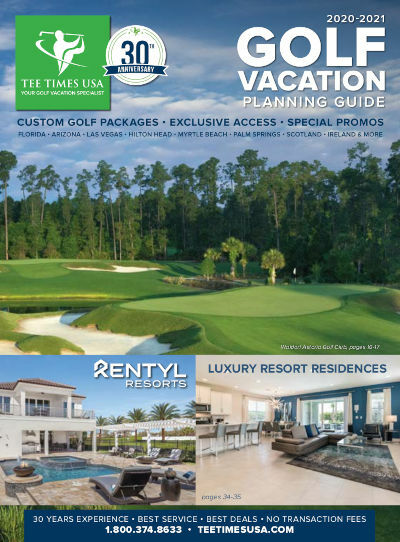 Golf Magazine rates World Woods Pine Barrens in its Top Ten and Rolling Oaks in the Top 50 of its Top 100 golf course listing. Also featured at World Woods is one of the best practice facilities in the country, which includes a 22-acre, four-sided practice range with multiple stations on each side. World Woods' 36-hole rate is one of the best golf deals in Florida. Pine Barrens, which is often compared to Pine Valley, winds through a heavily wooded pine forest that will make you forget you're in Florida. Rolling Oaks is often compared to Augusta National, offering nice slopes, meticulous fairways, beautiful oaks and flowering shrubs. World Woods has served as host to Shell's Wonderful World of Golf (Phil Mickelson vs. David Toms). Golf Magazine's (September 2009) "Top 100 Courses You Can Play in the United States"
Tom-Fazio designed 36-hole masterpiece,refers to it at his "best work"